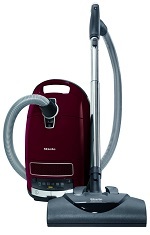 The Miele C3 lineup has a variety of full sized canister vacuums for just about any type of floor in your home. It doesn’t matter if you have mostly smooth floors like tile, linoleum, hardwood, and laminate or if you have thicker carpets you will find a C3 that will do the job. The “Soft Carpet” is a larger, more powerful vacuum cleaner with a variety of attachments to handle high pile carpeting. It takes a little more power and excellent filtration to effectively clean these floors, so the Soft Carpet was built with this in mind. All Miele cleaners are bagged and use high quality HyClean™ dustbags which work closely with the filters to provide a fully sealed system. This is an important quality of any machine designed to pull dust mites up from the carpet fibers as you don’t want them to pass through the filters and escape back out. With a fully sealed design almost no dirt particles will be able to get out so the air will be much healthier than it was before you started vacuuming. While it is a great feature to have for hard floors it is a must for high pile rugs. All C3’s seal the dust in so it cannot get out. The biggest feature that sets this canister apart from their other vacuums is the SoftCarpet Electrobrush. When you combine this power head attachment with their SoftCarpet power setting you get extremely powerful suction with gentle brush agitation. Their engineers carefully designed it to pull embedded particles from deep down in thick carpeting without doing the damage that some other large vacuum cleaners do. Some powerful uprights in particular do a good job cleaning but they can also wear out the feel of plush carpets over time, which is definitely what you don’t want to have happen to your investment. The C3 was purpose built to avoid this shortcoming without sacrificing cleaning ability. Like mentioned above the Soft Carpet comes with their AirClean Sealed System™. This system includes three different components working together: HyClean dust collection bags, HEPA motor protection filter, and an exhaust filter that serves as a last stand against anything escaping. In their testing it is rated to remove 99.9% of microscopic allergens down to the size of 0.3 microns. These organisms include dust mites, pet dander, pollen, and mold spores which can trigger an asthma or allergic reaction. Using a HEPA filtration system to remove them from your home is one of the most important ways to increase the comfort level while inside. The Miele Soft Carpet is a great choice for homes with either mostly carpeted floors or a combination of carpets and hard flooring. Tile, laminate, hardwood, and linoleum all need to be cleaned just as often as rugs. The parquet attachment works well on them as there is no need for spinning brushes, especially since these brushes can damage the surface. A full sized canister vacuum cleaner like those in the C3 lineup has the versatility to move from room to room, adjusting to any type of floor in its’ path. Plus it has the Miele quality behind it so you know it will last for many years. This isn’t one of the cheap, replacement level vacuums that are found in many of the big box stores. This model represents an investment into the indoor quality of your home. For more information including current pricing and shipping options, click here to visit our top rated eCommerce supplier.